EUR/USD is consolidating its recovery above 1.1300 on an improving market mood. There are three reasons for the rise, but also things to watch out for. The four-hour chart is balanced after the pair emerged from oversold conditions. EUR/USD is trading above 1.1300, balanced after recovering from the two-month lows at 1.1257. Stock markets are optimistic amid three positive drivers. The positive mood weighs on the safe-haven US Dollar. Trade talks between the US and China intensify as US Trade Representative Robert Lighthizer and Treasury Secretary Steven Mnuchin prepare for a top-level meeting in Beijing, with PM Liu He and also with President Xi Jinping. It was the American President Donald Trump, back in Washington, that provided a boost to markets. He said the March deadline could be pushed back if both sides are making progress towards a deal. Markets like the idea of pushing back the deadline and the US refraining from imposing new tariffs. Trump made additional news by showing his reluctant willingness to sign a bipartisan deal to provide some funding to border security, an agreement that will unlock an agreement to prevent a government shutdown. The deadline is on Friday, February 15th. He may do it "begrudgingly," but markets do not care about the details. The previous shutdown lasted 35 days and was the longest in US history. While Fed Chair Jerome Powell repeated familiar messages that the economy is doing well, a more significant surprise came from two of his colleagues at the FOMC. Both Esther George of the Federal Reserve Bank of Kansas City and Loretta Mester of the Cleveland seemed content. Both are known hawks and previously supported further rate hikes. The dovish shift from the hawks also weighs on the USD and supports stocks. All in all, the optimistic mood is supportive, but there are forces driving the euro down. Spain, the euro zone's fourth-largest economy, may face fresh elections in April. The minority government led by Pedro Sánchez will probably fail to pass the budget and call new elections. He lacks the support of separatist parties from Catalonia in a sensitive timing. Their leaders are tried for their involvement in staging a referendum deemed unconstitutional in October 2017. Elections may be called for mid-April and uncertainty about the country's new direction may weigh on the common currency. Another factor is Brexit. The clock is running down towards Brexit Day without a deal. While this is mostly a topic for pound traders, Brexit impacts the euro and the global mood as well. The euro-zone publishes industrial production numbers later on, and they will likely show a drop in December. The impact is set to be minimal as German and French figures are already out. The central event on the agenda is the US inflation report. Headline Consumer Price Index is forecast to decelerate amid falling energy prices while Core CPI, which is closely watched by the Fed is projected to remain stable. 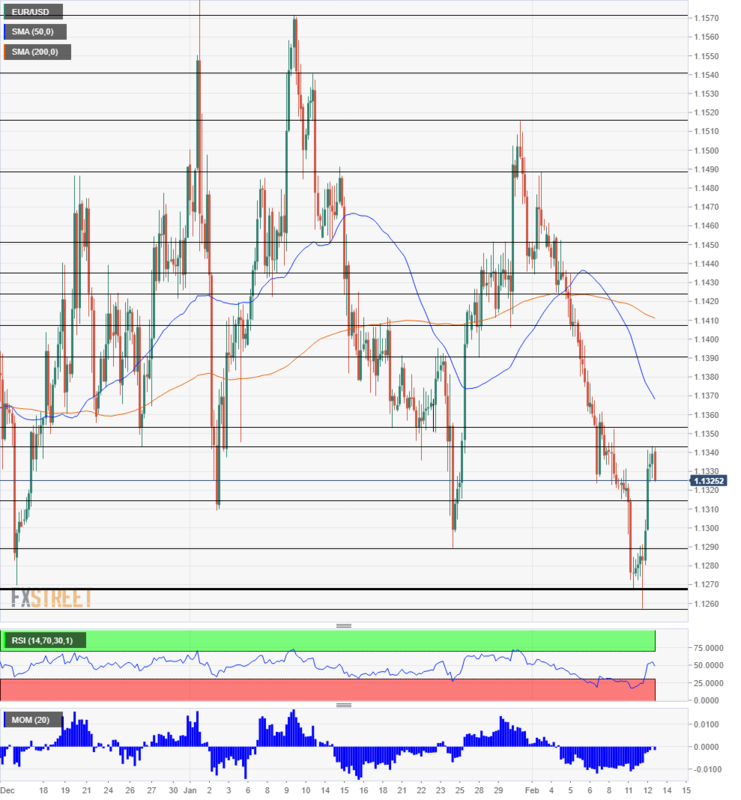 The four-hour chart shows that euro/dollar emerged from oversold conditions. The Relative Strength Index (RSI) jumped from below 30 to around 50, a balanced state. Downside Momentum has also waned, but it is not pointing to the upside just yet. The fresh high at 1.1343 is the immediate line of resistance. It is followed closely by 1.1355 which was a swing high earlier in the month. 1.1390 was a swing low in late January and serves as resistance. 1.1410 is where the 200 Simple Moving Average meets the prices, and almost perfectly coincides with another swing low from late January. 1.1315 was a swing low in early February and provides some support. 1.1290 was the January low and is already more significant. Further down, 1.1270 was a triple bottom before it was breached on Tuesday when EUR/USD hit 1.1257.